Connecting Aomori and Akita, the Resort Shirakami train allows passengers to experience the joys of leisurely train travel, beautiful natural landscapes and even traditional culture all in one go. The Resort Shirakami rolls across 147.2 kilometers between Aomori and Akita prefectures, a route that takes you through bucolic scenery, wild ocean views and the charms of small-town life, accented with dashes of local culture. 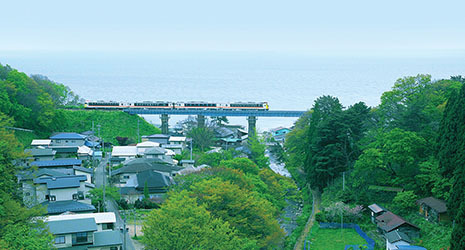 With a few round-trip runs per day (the exact times vary by season), Resort Shirakami trains run on the Gono Line using hybrid systems that combine diesel engines with lithium-ion batteries. Cars are laid out with various seating configurations and large windows designed to maximize scenic views. That includes box seats in a semi-private compartment and roomy coach seats, which recline comfortably and swivel to match the direction the train is traveling. The train leaves the city from Akita Station and the landscape soon opens up into the countryside, where rice paddies outnumber houses and buildings. Akita is famous for rice, and the delicious Akita Komachi variety is cultivated here. The next stop is Noshiro, which is known as a basketball town. A sign proudly introduces Noshiro Technical High School’s team, which has won national basketball championships fifty-eight times, as well as a semi-professional basketball team, the JR East Akita Basketball Club. 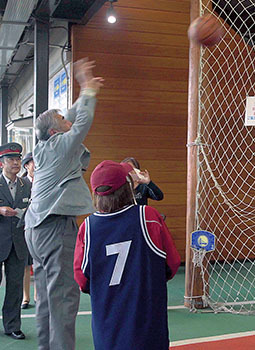 At Noshiro Station, everyone piles off the train to try a free throw. Those skilled or lucky enough to make the shot receive a little gift. After about forty minutes of countryside views the train reaches the sea, waves crashing on the rocks and seagulls crying overhead. The route goes through the Shirakami-Sanchi mountain district of northern Japan, a UNESCO World Heritage Site. Diminutive seaside villages cling to the coast, buoys and nets hang off the sides of the village homes, and passengers catch a glimpse of what life must be like here as the train rattles by. Onboard the train, there’s entertainment to be had. 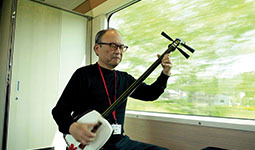 Every day of the week, shamisen players board partway through the journey and give a rousing jangly Tsugaru shamisen performance. Other days, passengers might get to see a puppet show or a storyteller narrating in the local dialect. Combining scenic sights, the romance of the railways and traditional culture, the Resort Shirakami will continue to charm visitors to Aomori and Akita for years to come.